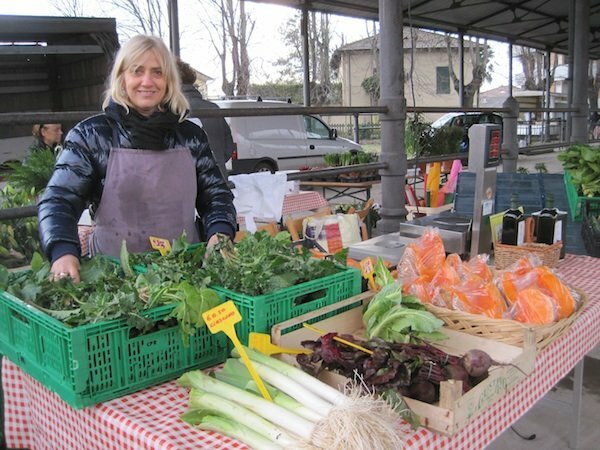 If you come to Lucca for only a day, arriving from Florence late morning and off early the next to get to the Cinque Terre, you’ll miss the pleasures of Borgo Giannotti. Compared to the amphitheatre, the Guinigi Tower with oaks growing on top, the wedding-cake columns of San Michele church and the massive encircling walls of the historic centre, Borgo Giannotti doesn’t look like much. 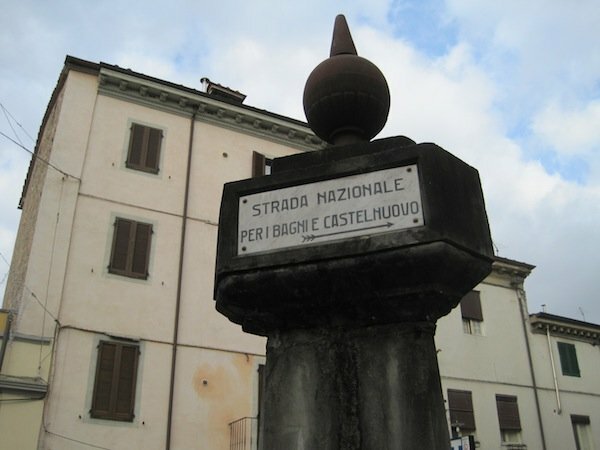 Immediately outside the north gate of Lucca, it was a meeting point for merchants coming from the port of Viareggio, a place to stop and refresh themselves before turning up the Serchio Valley to sell their merchandise in the Garfagnana. It developed into a thriving artisan quarter, and retains that vibrancy of people making and doing things, occupations that the waves of mobile phone shops haven’t yet totally swept away. 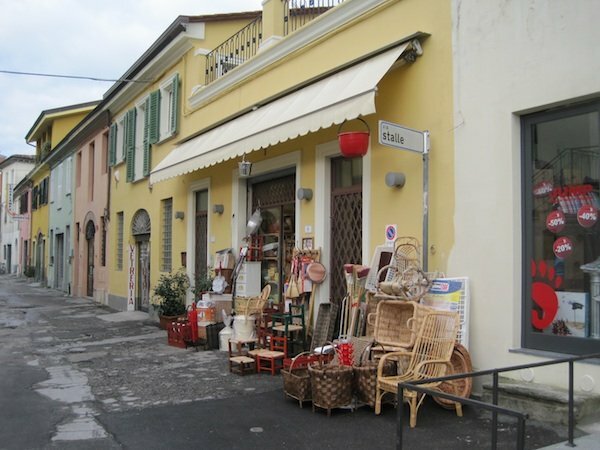 So come with me for a Saturday morning trawl in Borgo Giannotti. Locals arrive in droves (and park anywhere) to shop and have things mended. 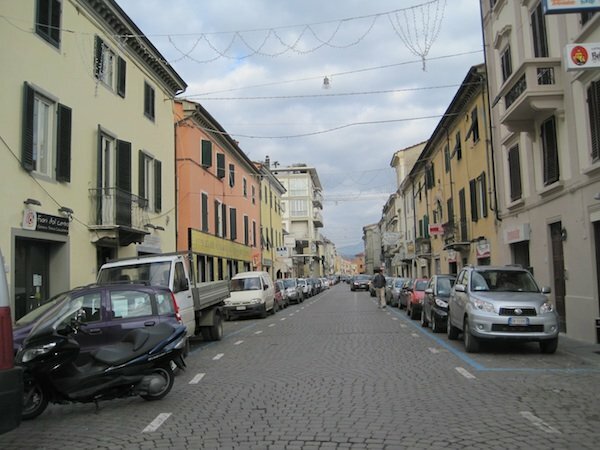 We might be mistaken for drunks, rare as they are here in Lucca, weaving from one side of the street to the other following the trail of my favourite places. 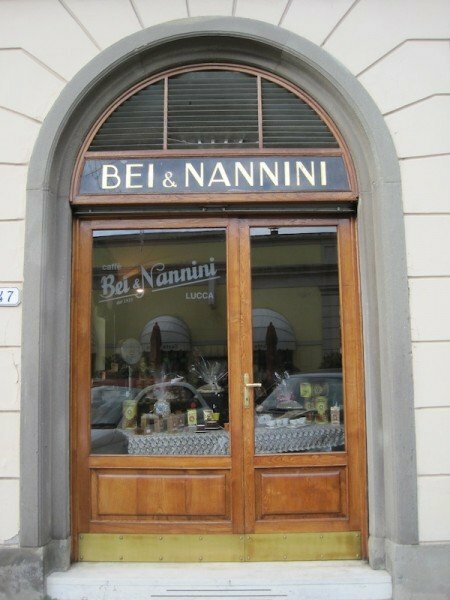 On the left we come to coffee importers and roasters Bei & Nannini. It’s not my favourite coffee, but I like the shop front and, apart from the coffee beans themselves, it’s local. 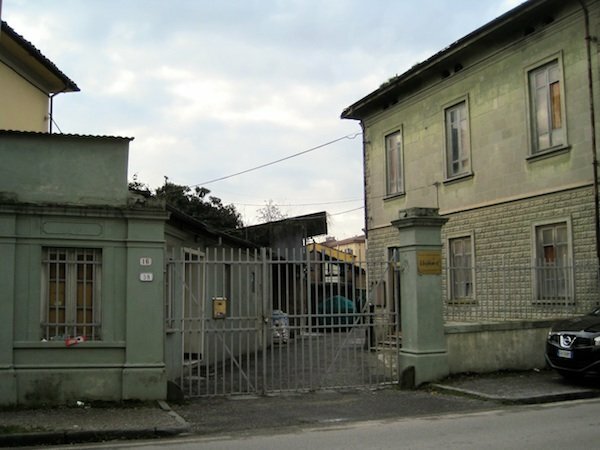 It was founded in 1923 by Guido Nannini and Giovanni Bei and is still in the ownership of the two families. 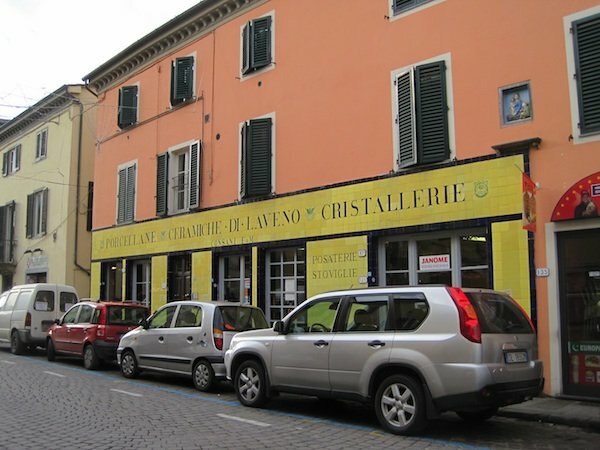 There are many small groceries, delicatessens and specialist food shops in Borgo Giannotti. 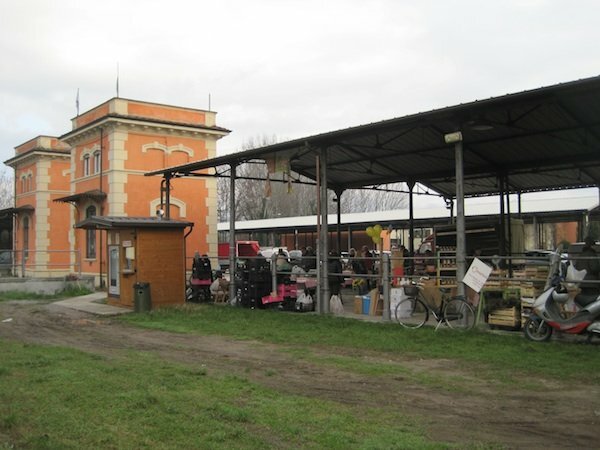 You can do all your shopping from the friendly vendors in the space of a few hundred metres without ever entering the anonymity of a supermarket. Crossing over to the right we find a fishmonger. A handy lifesaver hangs above the blackboard listing the catch of the day. 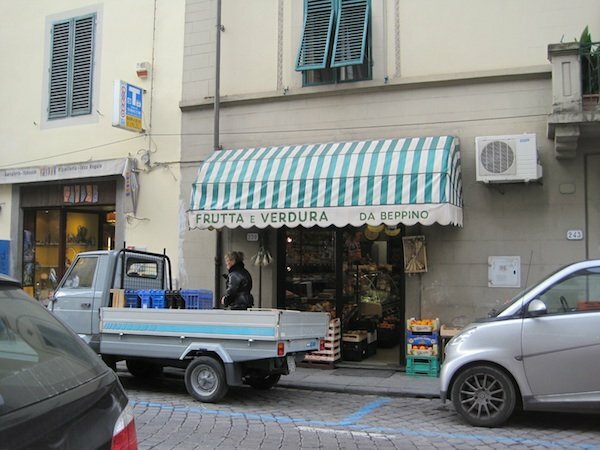 Over on the left is one of many fruit and vegetable shops. Since it’s Saturday, we’ll continue up the street to the farmers’ market. Still on the left, look at that exquisite tiled shop front (it was even more beautiful before some developer painted over the ochre wash above). 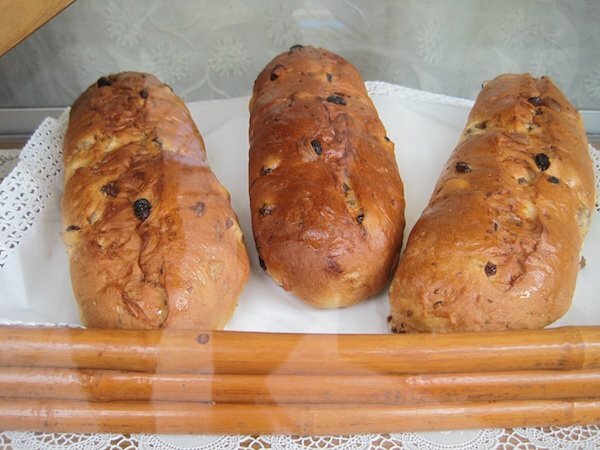 On the right we come to a bakery with many enticing goodies in its window. 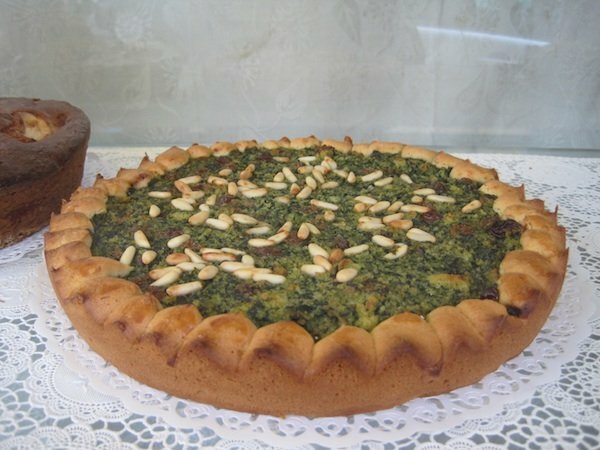 I suspect torta di erbi is a relict of Renaissance, and maybe mediaeval, times when sweet and savoury were often mixed in a single dish. As strange as it sounds, this delicious tart is filled with Swiss chard, parsley, bread crumbs, raisins, candied peel, pine nuts, grated pecorino and parmigiano, sugar, cinnamon, nutmeg, rum and eggs. Becchi means ‘birds’ beaks’ and refers to the form of the pastry; shaping them is a skill in itself. 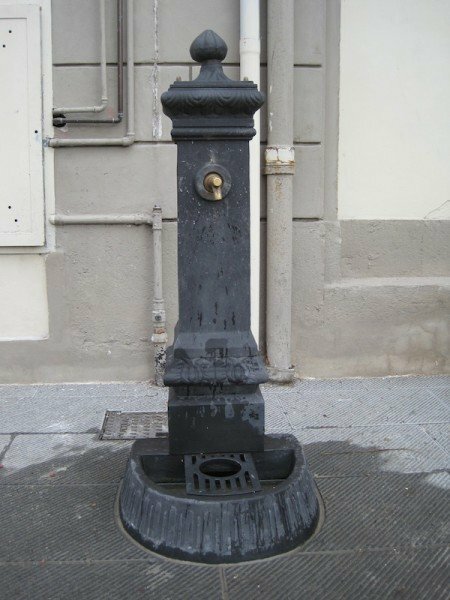 Over on the left again is a tap where locals come to fill their water bottles for drinking at home. It’s free! No need to carry bottled water. It’s on tap in the street. Next to the fountain is Angolo Bazaar where you can find almost any utensil or container you need for your household and many gifts to take to friends at home. It used to be on the corner (angolo), but moved down one space to make way for a discount sport shoe shop. Via Stalle means street of the barns—something like a mews in London. But if you don’t find what you’re looking for there, try my favourite Cesteria Lucchese. You could spend a couple of hours in this Aladdin’s cave starting with the baskets at the front and penetrating into deeper and deeper caverns stacked from floor to warehouse ceiling with crockery, wooden kitchen utensils, garden tools, hosepipes, canvas—an inventory too long to list. I’ve brought my sickle and pennato lucchese (a kind of billhook) to be sharpened opposite at L’Arrotino. Many people take their utensils to artisan sharpeners, and itinerant ones come to some open-air markets. 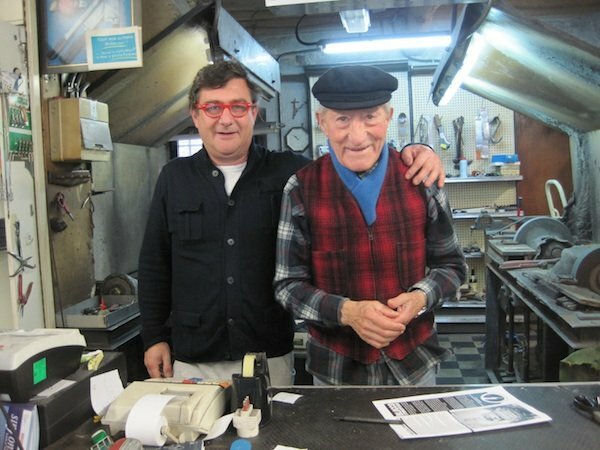 The Bertinis have been sharpening knives in Borgo Giannotti since 1956. They also sell quality knives from those forged traditionally in Italy to Japanese knives of Damascus steel. Every kitchen needs at least one! 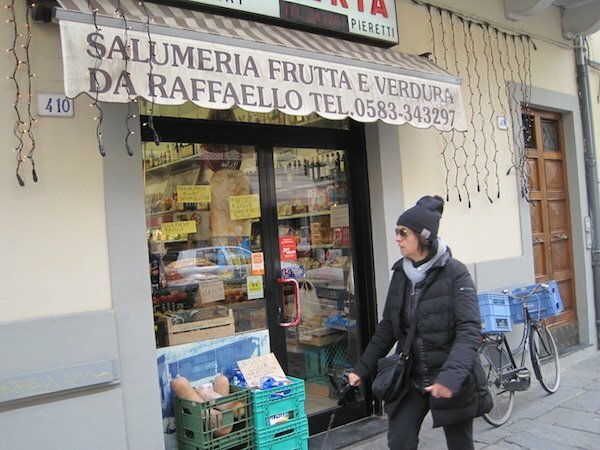 Continuing on the right, we come to a delicious smelling grocery stuffed with tasty products, including tortellini fresh from the Favilla pastificio of Lucca. 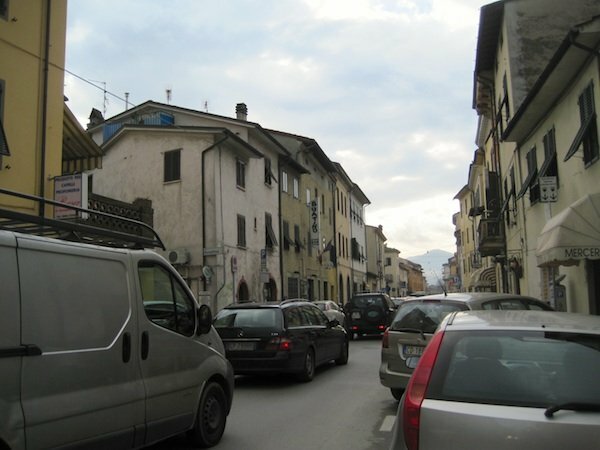 There’s something special along the road to the right, but first we’ll continue to the top of Borgo Giannotti. Remember this monument for our return trip. When it’s lunch time, we can eat at Buatino, where the cook changes the menu every day to take advantage of seasonal ingredients. 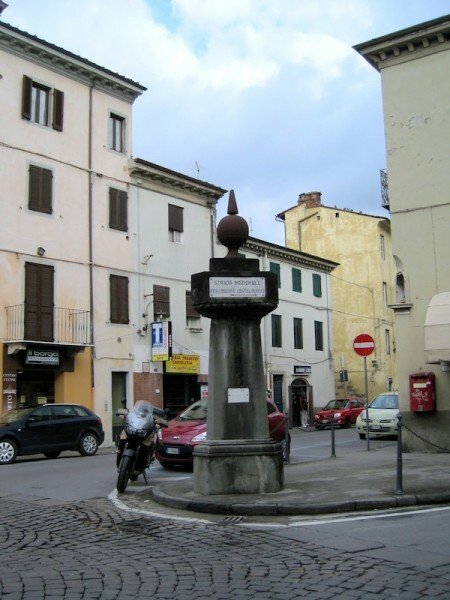 We cross over the outer ring road and come to the Foro Boario. This has nothing to do with wild boar. 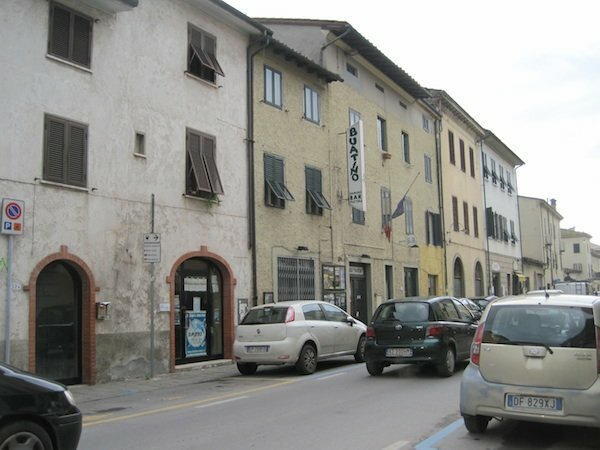 Boario refers to cattle and the Foro Boario was the cattle market, used in September when herders brought their animals to sell in the city. 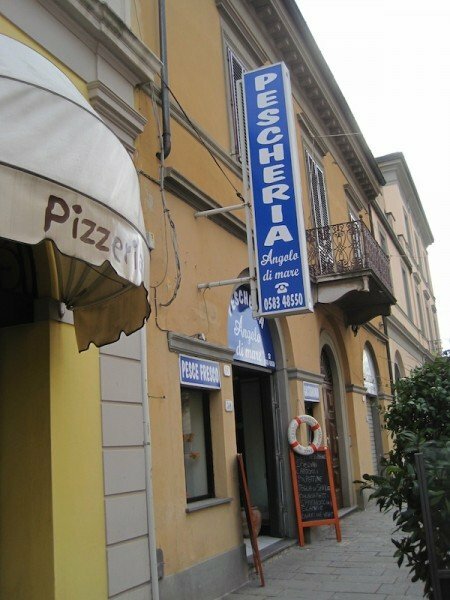 The Festa della Carne e della Macelleria Tradizionale (Festival of Meat and Traditional Butcher Shops) held annually in the middle of September commemorates this practice. More in the old spirit of farmers selling their produce to the public is the farmers’ market that takes place at the Foro every Saturday morning. If you buy your fruit and vegetables here, they’ll be fresh and seasonal. 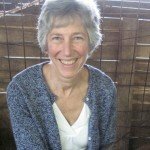 You’ll meet the growers and can ask for recipes for ingredients you’ve never used before. How does she cook that deep orange zucca Mantovana? Time for a coffee at the bar opposite the Foro and then we walk back to the monument, which turns out to be a road sign. 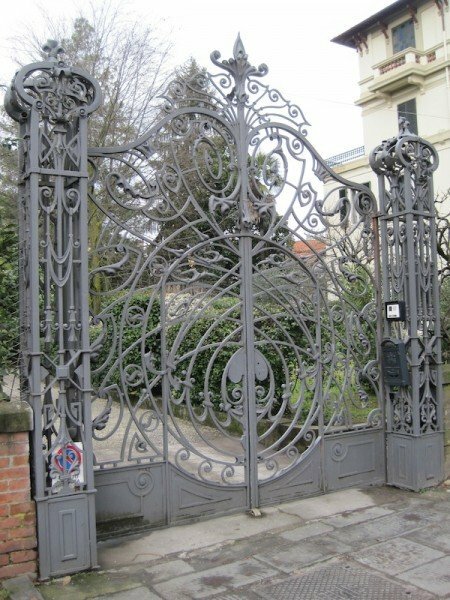 We turn left and if I weren’t with you, you’d walk right past this grey-green building and boring gate. You would be missing a great treat. 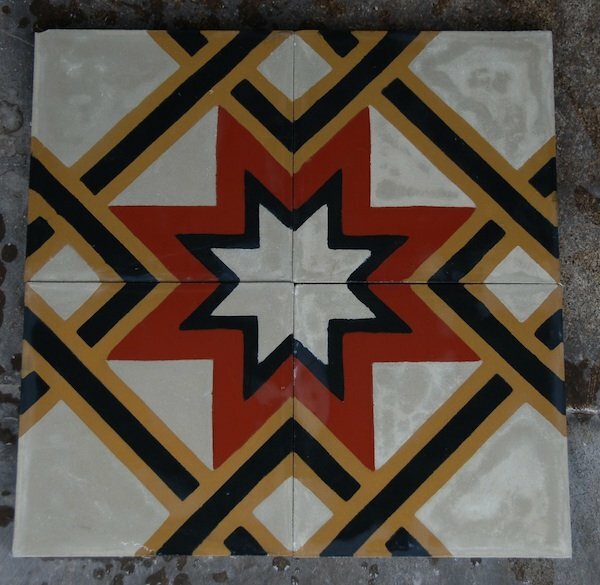 It’s a handmade tile factory founded by the current owner’s great-grandfather in 1902 to make tiles in the ‘Liberty’ or Art Nouveau style, which was all the rage in Europe at the time. Press your nose against the dirty showroom window (perhaps never washed since 1902?) 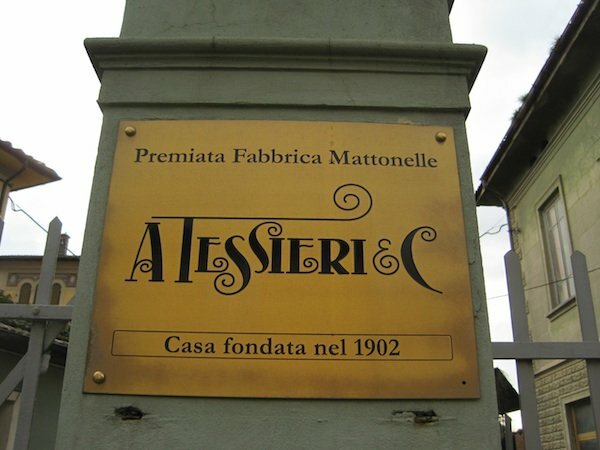 and you can see some of the patterns that Francesco Tessieri’s four artisans still make by the same techniques. 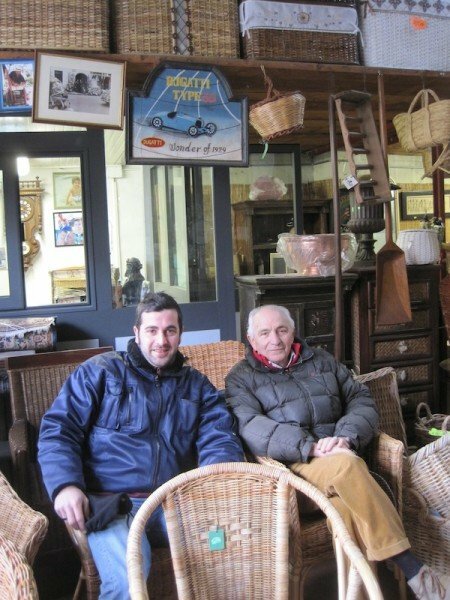 They’re closed on Saturdays, but if we come on a weekday, Francesco will take us into the workshop and explain as we watch the process. 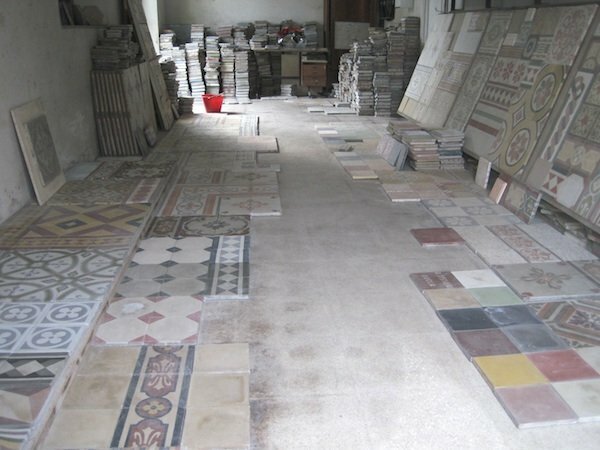 Among his many commissions were restorations of floors in the homes of Gucci and Pavarotti. Around the corner are some over-the-top examples of ‘stile Liberty’ houses whose floors are surely paved with Tessieri tiles. Our tour is done and it’s time for a delicious lengthy lunch accompanied by good wine and conversation. 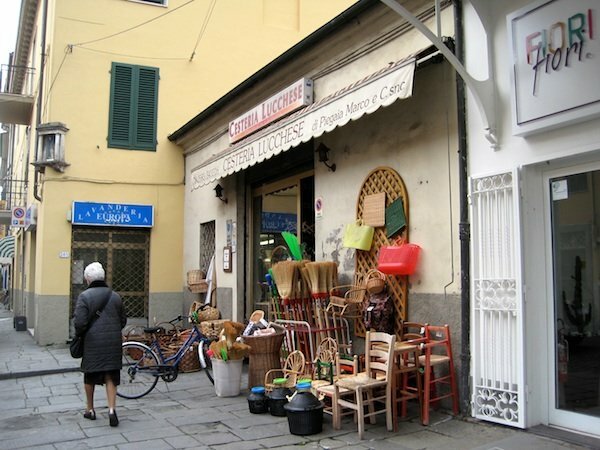 So like the merchants of old, why don’t you make Lucca your city to dawdle in, to catch your breath and refresh yourself? Borgo Giannotti is out the classic tour of Lucca, but one must find time to walk along the street and enjoy the true, old face of Lucca. Thank you, Antonella. 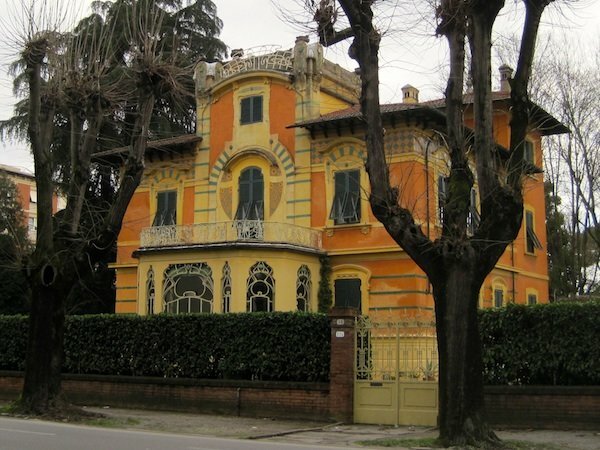 You probably know more than I do about Borgo Giannotti. We should meet for a coffee in one of the many bars. There are certainly lots of wonderful places to shop and eat here. I need to spend a lot more time in the area. I really want to get into that tile shop. Debra, let’s try to do it when you’re here this next time. BUT, no photos allowed in the workshop — trade secrets.